It was fall 1903. One hundred years earlier President Thomas Jefferson had sent Lewis and Clark to explore the American West. Now President Teddy Roosevelt was preparing to sign a treaty to give American ships access to a canal through Panama. In relative obscurity, the Wright Brothers were headed to Kitty Hawk, N.C., to continue experiments in human flight for a fourth year. 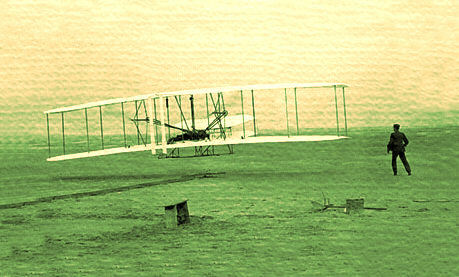 This time, on Dec. 17, 1903, their invention would fly 852 feet. It was the same year Henry Ford founded the Ford Motor Company, and the year of the first Tour de France. 1903 was also the year this small Church academy in Provo made an audacious proposal that its name be changed from Brigham Young Academy to Brigham Young University. In 1895 the High School, extant since 1876, had been established as a separate department of the Academy. In 1896, the College Department was added. The school had done nothing more to warrant the change. It had only 64 collegiate-level students, mixed in among classes for kindergarten, elementary, junior high and high school students. In fact, school officials had just staved off elimination of all college courses two years earlier, arguing that they were good competition for the University of Utah. LDS Church leaders, lead by President Joseph F. Smith, finally relented on that issue, concerned that they would lose control of matters at the state school that might be maintained at a church school. So in September 1903, Academy President Benjamin Cluff proposed separating out the school's college students to establish a "Joseph Smith College." The Board of Trustees agreed to change the school's name from Brigham Young Academy to Brigham Young University. It was hardly ready for so lofty a title. 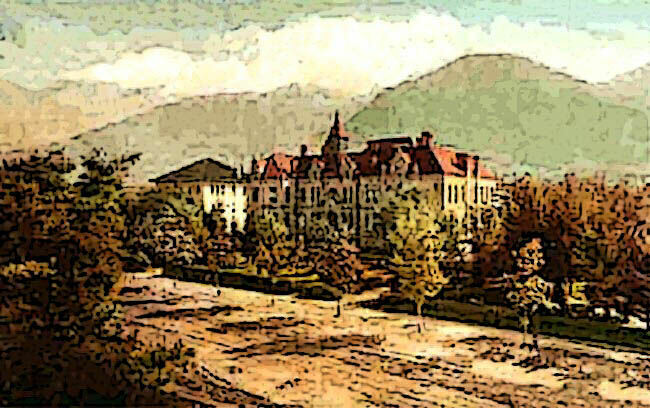 The campus was located on less than two blocks in what is now central Provo. But bolstered by a new vision of the future and the leadership of a BYH/BYU student, Byron Owen Colton, in February 1904 the independent school purchased 17 acres on Temple Hill from the City of Provo for $125 an acre. The new fields were first used for athletics. It was on the new "Upper Campus" that BYU would spread east and north for many decades, leaving a legacy to BY High of the historic "Lower Campus." The graduation programs for May of 1903 carried the name "Brigham Young Academy" for the last time. By the time graduation season rolled around again in spring of 1904, the "Brigham Young High School" and "Brigham Young University" names were prominently featured. At least one person, Anthon H. Lund, a member of the LDS Church's First Presidency, was uneasy about the name change. On Sept. 30, he wrote in his journal, "I hope their head will grow big enough for the hat." Of course, a century of discovery and invention later, BYU's hat has become too small for its head. It evolved from an all-purpose school for Mormon kids snuggled in quaint, isolated Utah Valley, to become the second-largest private university in the United States, with more than 30,000 students from all over the world. Sadly, the venerable and historic alma mater of BYU: Brigham Young High School, BYU Training School, and Academy Square itself, was abruptly idled, closed and abandoned in 1968. But back in 1904, Brigham Young High School continued to be the dominant social and cultural force behind the life of the newly named Brigham Young University. For example, in 1906 the BYHS Class of 1907 started a chain of events that led to the placing of the block �Y� on "Y Mountain" in the spring of 1906. The Karl G. Maeser Memorial & the block "Y"
In 1909 work began on the Karl G. Maeser Memorial building, the first building on the upper campus. It was dedicated in May of 1912, and in the same year a monumental gate was added to the southwest corner of the Lower Campus. It became known to five generations of BY High students as "The Pearly Gates." Many years passed before the University enrollment exceeded the High School enrollment. For example, in 1903-04 the combined school had 14 faculty, 825 high school students, and 74 collegiate students. In 1910 there were still more than 800 high school students, compared to approximately 200 university students. Besides the Education Building, which was called the High School Building until 1922, the high school used five other buildings on the lower campus: the Arts Building, the Men's Gym, the Women's Gym, College Hall with its auditorum, and the Industrial Arts Building. The Men's Gym had its beginnings in an article which appeared in the school newspaper in 1899 written by Eugene L. Roberts. This article pointed to the need of a men's gymnasium separate from the existing Women's Gym. Adequate funds, however, were not available to construct a separate gymnasium. 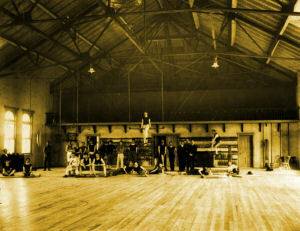 The third floor Men's Gym, in 1902. 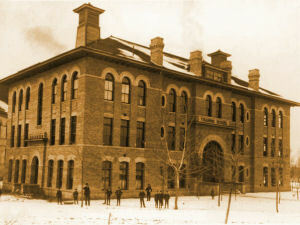 The BYU Training Building, new in 1902. However, when the Training School Building was approved, a third floor was added to the original plans and was devoted to a men's gymnasium. The building was completed in 1902 through the financial assistance of Jesse Knight. The gym probably should have been named "The Knight Gymnasium". Many generations of basketball players have thundered up and down the indoor flights of stairs to the Men's Gym for hours at a time, building their athletic stamina. The construction for the Industrial Arts Building began in 1904. It was the philosophy of Brigham Young that boys should learn to do something with their hands as well as their minds, and this building was in partial fulfilment of that philosophy. The building was constructed in order to provide courses in iron work and mechanics. The first blacksmithing class was approved in 1904 and got underway in January 1905, when citizens from the city of Provo donated ten forges. 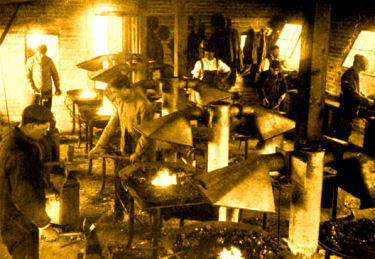 BY Industrial Arts forges in 1905. The Arts Building was constructed just to the left of the main 1892 Academy Education building, as one faces the main building. It was originally constructed to serve as a missionary training school. The Alpine, Nebo, Utah and Wasatch stakes contributed funds for the building. It was dedicated in 1903. 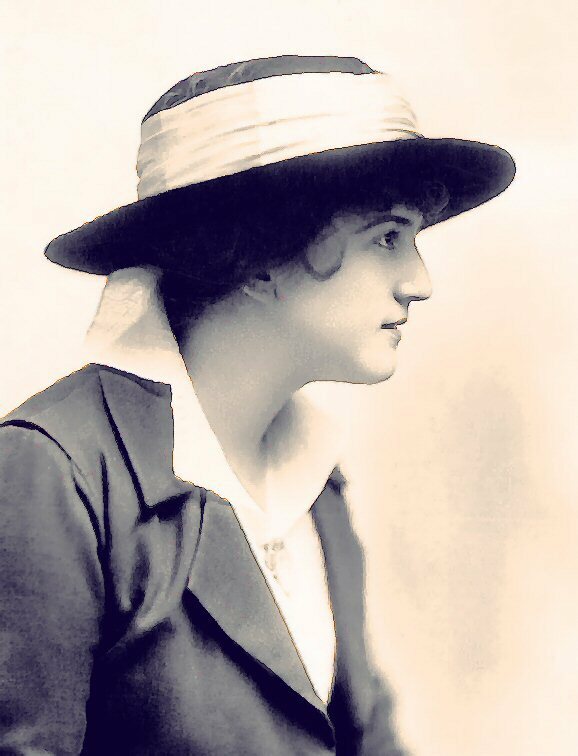 Emma Lucy Gates sang a series of concerts to raise money to equip the third floor for home economics, and that floor was named the Lucy B. Young Domestic Department. 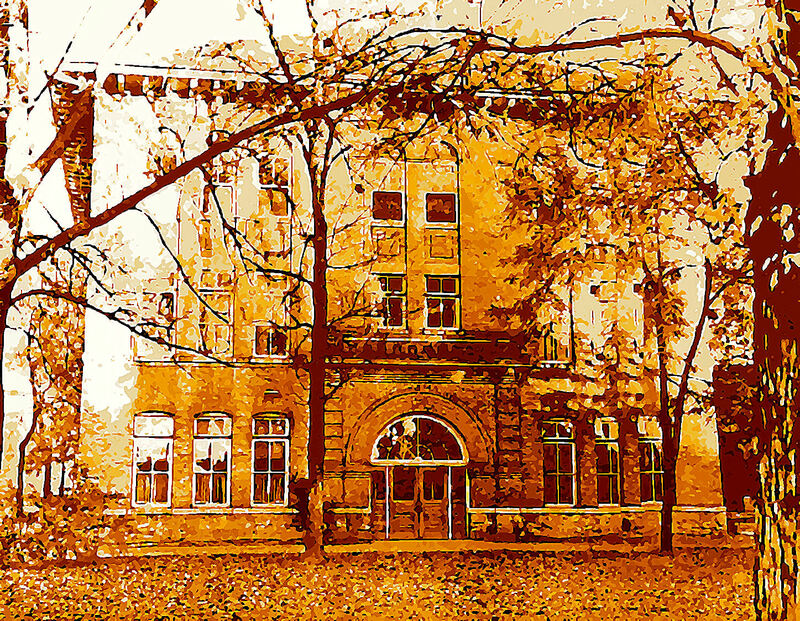 The Arts Building was completed in 1904 and dedicated in 1908. A landmark decision was made in 1908. BYU President George Brimhall got the Church Board of Education to agree in 1908 that BYU would be the official college for church teachers. Shocked, the administrators and faculty of Brigham Young Academy in Logan protested, to no avail, and the Provo school's role in the Church was cemented. 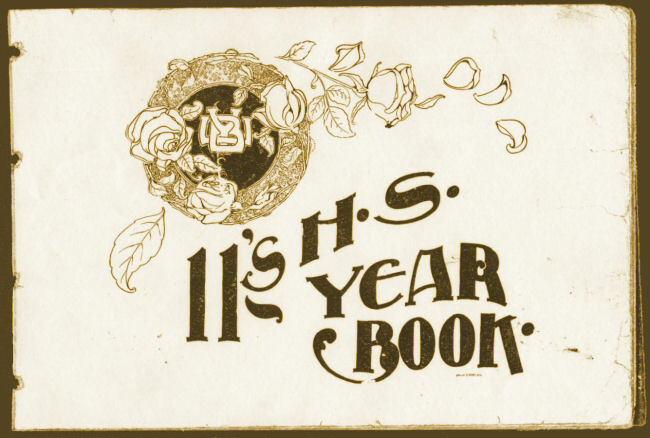 In the 1920s, BY High adopted as their mascot the name "Wildcats" and when the high school began to regularly publish its own yearbooks, most of them carried the title "Wildcat". There is a reason you won't find any historic football photos taken during the first two decades of the 20th century. In the 1890s there had been many serious football injuries throughout the US, and one fatality at another Utah university. On October 12, 1900, the Board of Trustees led by President Joseph F. Smith made a decision to ban football at both BYU and BY High. It was not reintroduced into the athletic curriculum until 1919, once again qualifying BY High to play in area football tournaments. The High School Class of 1912 built a stone and iron gate on the southwest corner of the campus. It served as a Provo landmark for five decades, until the early 1960s, when it fell into disrepair and was removed. New gates was recently reconstructed. Many of the sidewalks surrounding the campus were constructed with funding donated by various high school classes. In 1914, the school's debts reached a monumental $185,000. A gift of $20,000 from Jesse Knight and a loan from a church-held company helped, but by 1918 the fiscally independent university still owed $113,500. Finally, the Church stepped in and, in exchange for the school's real estate, assumed the obligations. The school's financial independence was surrendered but the new arrangement was critical to future stability. The University and BY High were now subsidized by Church tithing funds, typically one-third of its annual budgets. Known as "The Great War" until the outbreak of World War II, World War I began on August 1, 1914. Woodrow Wilson kept the United States out of the war until April of 1917, when he asked for a declaration of war from Congress. That the members of the BYH Class of 1918 graduated in a time of high patriotic fervor is reflected in their graduation program. Americans contributed whole-heartedly to "the war to end all wars." This great effort ended with armistice on November 11, 1918. Jubilant Utahns rushed into the streets to rejoice, waving flags and cheering. Chimes rang out in celebration in every Utah city that had a bell. Car owners honked their horns endlessly. Stores of fireworks accumulated for this purpose were set off. Approximately 25,000 men from Utah had volunteered or were drafted into the war. Utah's economy prospered because of the war. New coal mines were opened, copper and other metal mining expanded, smelters ran at or near full capacity, and farmers and ranchers received more for their crops than any other time in recent decades. November 1918 brought historic national and Church milestones. 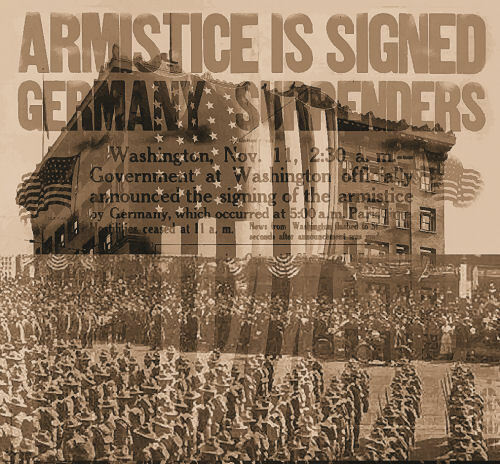 Armistice Day arrived on November 11. Heber J. Grant became President of the Church on November 23, following the death of Joseph F. Smith in Salt Lake City on November 19, after 17 years as president. Then began the glorious homecoming of Utah's soldiers in 1919, which was openly celebrated despite worries about the influenza pandemic of 1918. The size of each class at B.Y. High School, which had sometimes exceeded 150, began to be limited to fifty, beginning with the Freshman class in 1920. 1. The Collegiate Department was established in 1903 at the time the university was first organized. John C. Swensen served as principal between 1903 and 1904. The department was reorganized as "The College" in 1904. This department was responsible for teaching college-level courses in theology, English, history, mathematics, natural science, pedagogy, Spanish, physical science, music, gymnasium, domestic art, drawing, drafting, and woodwork. 2. The Normal School was established within Brigham Young University in 1903 and was also known as the "Normal Training School" or the "Church Normal Training School". In 1913, the school merged into the "Church Teachers' College". During its years of operation, the Normal School was under the direction of principals George H. Brimhall and James L. Brown. 3. The Commercial School was established in 1903 when Brigham Young Academy was organized into eight schools or departments, each one under the direction of an approved principal. Later in 1909, the Commercial School merged into the "Brigham Young High School". Between 1903 and 1909, the Commercial School was organized to equip students with strong, moral, social, and spiritual character in order to receive competitive business training. For this purpose, the school provided a four years' business course, a brief course in bookkeeping, a special course in bookkeeping and arithmetic, a brief course in shorthand and typewriting, a special course in shorthand and typewriting, and a brief course in telegraphy. The Commercial School was directed by Joseph B. Keeler, Principal, under the direction of the president of the university. In addition, the Commercial School also administered the high school commercial curriculum during the early part of President Brimhall's presidency. 4. The Missionary Department was established within Brigham Young University in 1903. Starting in the 1904 to 1905 school year, the Missionary Department existed within the "Preparatory School" until the department merged into "Brigham Young High School" in 1907 as a missionary course. The principal for the department was Orin W. Jarvis. 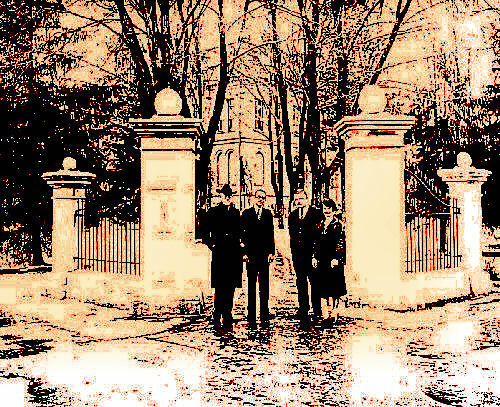 Between 1903 and 1904, the Missionary Department was organized to prepare missionaries by supplying them information they would need in the field of labor. For this purpose, the department provided an environment for missionaries to discuss doctrines, principles, and bear testimony in an effort to lighten the burden of worldliness placed on young men. Courses of Theology, Reading, Singing, English, and Foreign Languages also helped prepare the missionaries who were required to have a call from the First Presidency of the Church of Jesus Christ of Latter-day Saints to serve as its representatives in order to enroll in the Missionary Department. 5. 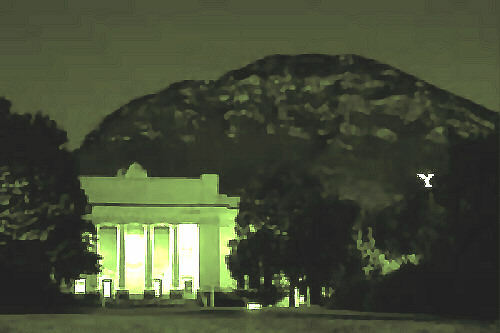 The School of Music was established within Brigham Young University in 1903 and continued in operation until it merged into the the "Church Teachers' College" and became a department in "Brigham Young High School" in 1909. The School of Music was under the direction of Anthony C. Lund (1903-1909). The School of Music was established to provide theoretical and practical instruction in vocal and instrumental music, promote industry and emulation, help musicians in training become more accustomed to public performances, as well as instilling in them a liberal taste in music. 6. Brigham Young High School, extant in fact since 1876, the High School was established in 1895 as a separate department of Brigham Young Academy. In 1902 the High School was administered in the Normal School in the Academy. However, in 1904, Brigham Young High School became its own entity under the direction of a principal, and continued under the direct jurisdiction of the newly organized University. When the University reorganized again in 1920, secondary teacher training for students in the College of Education was provided in the Brigham Young High School. In 1921 the High School became an entity of the Secondary Training School which became part of the Training Schools maintained by the College of Education in 1922. The High School continued to exist in the "Secondary Training School" when the Training Schools were established as the Laboratory School in the College of Education in 1955. Consequently, the name of the Secondary Training School changed to the "Secondary Laboratory School" in that same year. Brigham Young High School existed in the Laboratory School until both discontinued their operation in 1968. 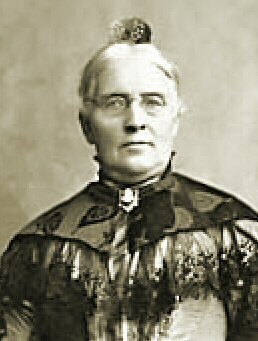 Principals of Brigham Young High School included: Warren Dusenberry (1876), Karl G. Maeser (1876 -1892), Benjamin Cluff, Jr. (1892- 1895), George H. Brimhall (1895 � 1900), Nels Lars Nelson (1900 � 1904), Edwin S. Hinckley (1904 � 1909), William H. Boyle, Jr. (1909 � 1926), Asael C. Lambert (1926 � 1928), Edgar M. Jenson (1928 � 1935), Golden L. Woolf (1935 � 1946), A. John Clarke (1946 � 1949), Herbert K. Christensen (1949 � 1950), Wayne L. Sorenson (1950 � 1952), Rowan C. Stutz (1952 � 1954), Morris A. Shirts (1954 � 1956), Don L. McConkie (1956 � 1957), John W. Tucker (1957 � 1958), Max J. Berryessa (1958 � 1961), W. Dwayne Belt (1961 � 1962), H. David Nelson (1962 � 1964), Lowell D. Thomson (1964 � 1968). Between 1902 and 1903, the Normal and High School provided three different four-year courses of study: General Course, Science Course, and the Normal Course. "The General Course" was for those students with no desire to teach or further their education after high school. "The Science Course" was for students desiring to go into college to study architecture or a branch of engineering. "The Normal Course" was designed to train students to be teachers. When the High School separated from the Normal School, it retained only two courses of study, but eventually organized the "English Course", in place of the General Course, to train students in the work of life, literacy, and to enter college or other higher institutions. Beginning in 1921, the High School, as part of the Secondary Training School, was organized to provide an advantageous education in a university setting for students not yet ready for college work while providing student teaching practice for the university students in the College of Education. 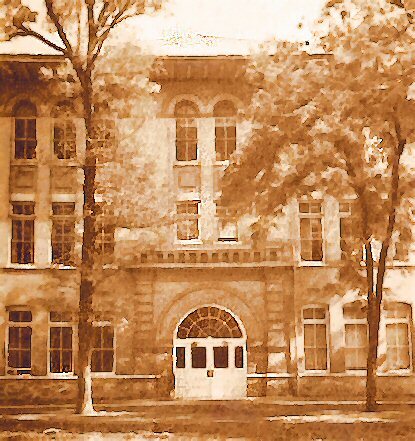 From 1955 until its doors were closed in 1968, the High School, as part of the Secondary Laboratory School in the Laboratory School, provided an environment in which student teachers in the College of Education could receive training, along with observing and researching educational programs. During Brigham Young High School's existence at Brigham Young University, it was the administering body for many different departments and courses which changed periodically. When Brigham Young High School was under the jurisdiction of the University itself, the High School was supervised by a principal under the direction of the president of the university. When the High School was organized within the Secondary Training School under the jurisdiction of the College of Education, the High School was supervised by the principal, and by the director of the Training School, under the direction of the dean of the College of Education. Finally, when the Laboratory School was established in 1955, the dean of the College of Education was still the chief administrator with the coordinator or director of the Laboratory School, followed by the principals and administrative assistants of the High School. 7. The White and Blue was the campus newspaper, first published in 1898. The paper was overseen by an editor and business manager. Starting in 1909, the publication was overseen by the Student Body. The format was changed in 1921, and the name was named to "Y News". Editors included: Ed Rowe (1898-1899), R. Leo Bird (1899-1900), A. L. Neff (1900-1901), David D. Rust (1901-1902), J. Frank Day (1902-1903), Willis L. Mangum (1903-1905), P. C. Peterson, Jr. (1905-1906), Ashley Bartlett (1906-1907), Heber C. Snell (1907-1908), Clarence Jacob (1908-1909), Dr. C. H. Carroll (1909-1910), Heber C. Snell (1910-1911), P. C. Peterson, Jr. (1911-1912), Charles Schwencke (1912-1914), N. H. Savage (1914-1915), G. Oscar Russell (1915-1916), Louis Brandley (1916-1917), Sterling Ercanbrack (1917-1918), Lucile Talmage (1918-1919), Joseph Olpin (1919-1920), Le Roy Cox (1920-1921), La Vieve Huish (1921-1922), Alberta Huish (1922-1923). The White and Blue later came back to life as a student-run literary journal. 8. The Brigham Young University Beaver Branch was formally called "Beaver Branch Brigham Young University" and abbreviated as B.B.B.Y.U. The Beaver Branch was a high school that began as part of Brigham Young Academy. It was open to all faiths, but based on Mormon doctrine and required ecclesiastical endorsement for admission. It was located at the entrance of Beaver Canyon. 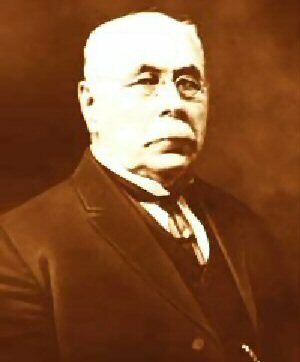 Its first principal was Ernest DeAlton Partridge, who served for three years. 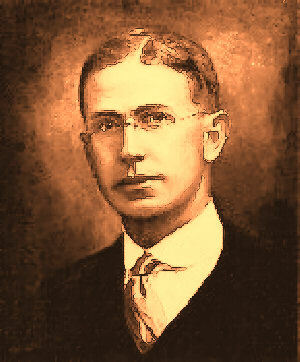 Other principals included Andrew B. Anderson (1903-1904, 1906-1907) and Josiah E. Hickman (1907-1908). In 1908, the Beaver Branch became a separate entity and was renamed the Murdock Academy. The Beaver Branch of Brigham Young University was a three-year preparatory school responsible for teaching high school courses to future teachers. Courses included Theology, Music, Math, English (penmanship, reading, grammar, elocution, and spelling), History subjects, Sciences, Drawing, Woodwork, Ironwork, Needlework, Cooking, and Theory of Teaching. The Polysophical Society was an organization responsible for recreation. The Beaver Branch had an executive committee, a President (of BYU), a Principal, and a faculty of Professors. Third, the "Music Department which specialized in vocal and instrumental, piano and" organ, music. Later another department developed: the Department of Industrial Courses. Many new subjects were introduced. The Beaver Branch was part of Brigham Young University, where students completed their fourth year of training and from which they graduated.